1. 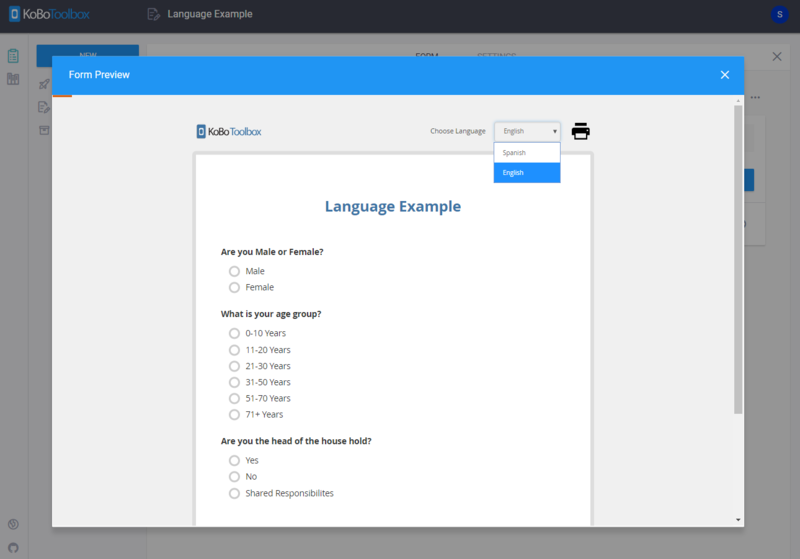 Create your form in the default language either by using the form builder or setting the form up as an XLS file and then upload it directly to KoBoToolbox. The default language should be the language that the person responsible for designing the questionnaire is most comfortable with. 2. When you are done, or when a significant portion of the form has been created, save it. You'll be returned to the draft form's project dashboard. 3. Find and click on the 'More Actions' icon (3 dots). In the drop down menu that appears, click on 'Manage Translations'. 4. 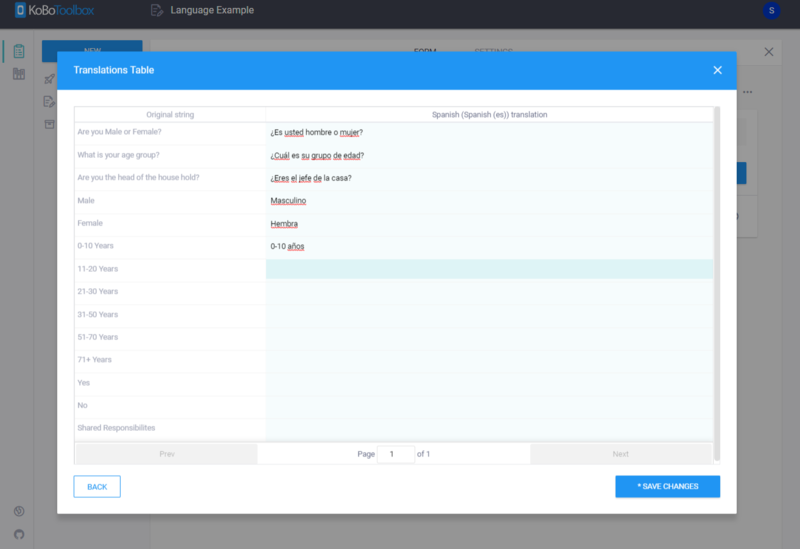 Before adding additional languages, first set your default language by clicking on the pencil icon and filling in the 'Language name' and 'Language code (language + subtag)' fields. Tip: If you're unsure of what your language code is, you can search through the entire list of language codes at www.iana.org. If you cannot find your language, its possible it has been labeled as something else and is worth searching online for alternative names. Examples: English (en), German (de), Arabic (ar), etc. 5. Once the default language has been set, click on the 'Add Language' button to fill in the language name and code for the new language being added. 6. After the new language has been added, click on the 'Update translations' icon (world) to the right of the language title to open up the 'Translations Table' for that language. 7. Fill in the translations with correct associated original strings in the table view and then click 'Save Changes' when finished. Then close out the table view by clicking on the 'x' button in the top right of the table. 8. Back in the project dashboard click on 'Preview' icon (eyeball) to open a preview of the form. At the top next to Choose Language click on the dropdown. It will have default (your original language) as well as the new language(s) you just added. 9. Repeat steps for any additional languages. The default language should be the most common language used during data collection. To change the default language, click on 'Manage Translations' and then click on the icon that appears to the right of the intended language when your mouse hovers over it.